Installation view from Taking Heart in the Age of Mechanical Reproduction with works by Charles Cohen (left) and Jason Bryant (right.) Photography Courtesy of Haik Studio. 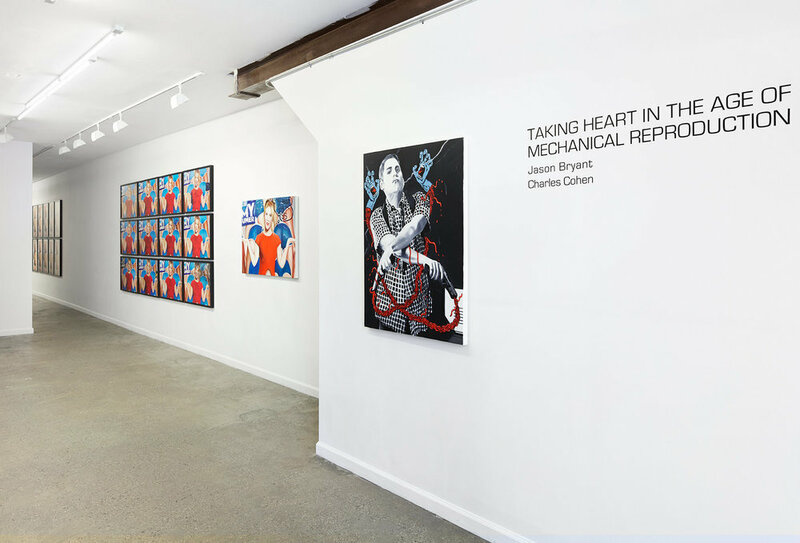 Equity Gallery is pleased to present Taking Heart in the Age of Mechanical Reproduction, a joint exhibition by painter Jason Bryant and photographer Charles Cohen. The exhibition will be on view from October 13 - November 25, 2017, with a public opening reception on Friday, October 13, from 6 PM - 8 PM. In this collaborative show, Bryant presents paintings of Cohen’s photographs of the iterations of four advertisements as they appeared throughout the New York City subway system. Cohen has created photographic copies of copies and Bryant has created photo-realistic, original paintings of Cohen’s copies. The process itself asks the often ignored question, what is an original? While Cohen and Bryant direct us to Walter Benjamin’s landmark essay, The Work of Art in The Age of Mechanical Reproduction, as the conceptual basis, they consider it an entry point to diverse cultural insights into socio economics, gender, celebrity, humor and violence. The work in the exhibition demonstrates that when considering the life of a copy, like that of a subway ad, the unique variations in installation, lighting and the markings of artists, all function as conduits of originality. Bryant and Cohen ask us to abandon the dualistic paradigm of original and copy so that we can surrender to the unique experience of viewing the work. Jason Bryant (b. 1976 in Wilson, North Carolina) is a painter currently living and working in New York City. Bryant graduated from East Carolina University with a BFA and went on to the Maryland Institute College of Art for his MFA in painting. Bryant moved to New York City soon after and began work with such notable artists as Kehinde Wiley and Bjarne Melgaard. Bryant’s paintings have been exhibited across the United States, Europe, and Australia, are represented by galleries in New York, London, and the Gold Coast, and are collected worldwide. His work has been featured and covered in Juxtapoz Magazine, Thrasher (U.S. and France), NY Arts Magazine, American Artist, Ocean Home Magazine, and Time Out New York. Bryant’s first museum retrospective opened at the Rocky Mount Arts Center in North Carolina in October 2014. Most recently, Bryant had a solo exhibition For Your Viewing Pleasure in Australia in the Fall of 2016. Charles Cohen (b. 1968 in New York City) is a contemporary photographer. He received a MFA with honors from the Rhode Island School of Design in 1995, and completed a fellowship at the Museum of Fine Arts in Houston in 1999. He has exhibited widely in the United States. Among his eight solo exhibitions are “Buff,” Bonni Benrubi Gallery, New York (2006), and “Your Condition is Not Permanent,” Genovese/Sullivan Gallery, Boston (2004). His work is held in museum collections including the Fogg Art Museum, Cambridge, Museum of Fine Arts, Houston, and Portland Museum of Art, Oregon. Private collectors include Fidelity Investments, New York, and Deborah Martin Kao, chief curator of the Harvard Art Museums. Cohen is featured in Digital Art, part of the Thame & Hudson World of Art series. Cohen lives and works in New York.